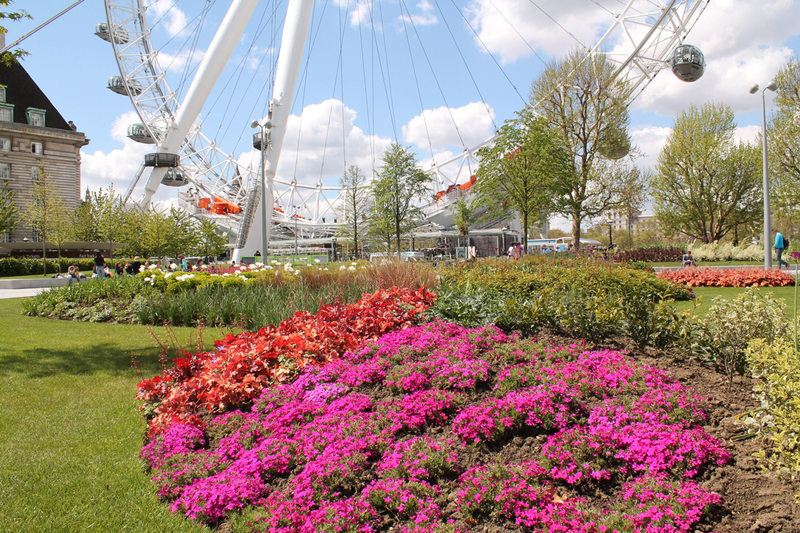 The Jubilee Gardens Trust, made up of residents’ organisations, local businesses and neighbouring landowners, is the local charity responsible for the management and maintenance of Jubilee Gardens next to the London Eye. The park first appeared on the public radar in 1951 when it was the site of the Festival of Britain’s prime building, the Dome of Discovery, as well as its striking temporary landmark: the Skylon. When these temporary buildings were dismantled the site became a car park. It remained so until 1977 when a park was laid out for the Queen’s Silver Jubilee. The construction of the Jubilee Line extension and of the Golden Jubilee Bridges led to the deterioration of the gardens, which have since been put under even greater pressure as South Bank has become recognised as a top tourist destination attracting some 25m visits a year. The recent transformation of the Gardens has been managed by an innovative partnership, the Jubilee Gardens Project Board comprising of Lambeth Council, Southbank Centre, previous owner of Jubilee Gardens, the Jubilee Gardens Trust, which is responsible for the management and maintenance of the Gardens, and Transport for London, which provided funding towards the project on behalf of the Mayor. Other funding came from Lambeth Council, secured under section 106 planning agreements with Shell and The London Eye, and contributions were made from several charitable trusts including the 29 May 1961 Trust, The Gosling Foundation and The Hobson Trust. The contract was carried out by Frosts Landscape Construction Ltd, whose other projects include work on the Olympic Park and who are specialists in landscaping, gardening, green roofs and walls, ponds, block paving and more. The landscape was designed by landscape architects West 8, a cutting-edge practice which delivers ground-breaking urban parks and public spaces worldwide. The project was remarkable in bringing together a very wide range of partners including: Southbank Centre, Lambeth Council, Shell and London Eye, the Mayor of London, the Jubilee Gardens Trust, Kate Hoey MP, Rt Hon Jeremy Hunt, the Shirayama Corporation, South Bank Employers’ Group and other donors. By working in partnership this group created a wonderful green vision for gardens in London’s most vibrant area and secured the funding and planning consent with huge public support. Work was completed on site 35 years after the gardens were first created to celebrate the Queen’s Silver Jubilee in 1977. Please complete this form to submit your query.